ATN NVWSM35010 Aries MK 350 Guardian Night Vision Riflescope FREE SHIPPING! The ATN Aries MK 350 Guardian Night Vision Riflescope is an extremely compact, first generation design that provides high performance at a modest price. It attaches to a standard Weaver or Picatinny raisl and measures just 10.8-inches long, guaranteeing compatibility with a wide range of firearms. The large, fast objective lens maximizes light transmission for a clear, bright image. The scope includes an advanced red-on-green reticle with adjustable brightness that ensures visibility against any color backdrop. When light levels drop to zero, the detachable IR450 infrared illuminator takes over to maintain visibility with vivid details. 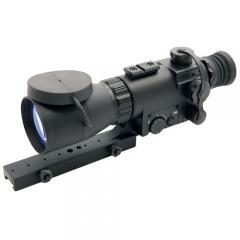 ©2002-2019 CopsPlus.com: ATN NVWSM35010 Aries MK 350 Guardian Night Vision Riflescope FREE SHIPPING!